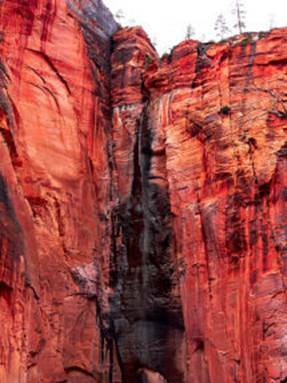 Zion National Park is one we considered over rated. 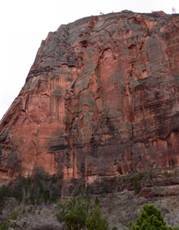 (3) challenging hikes up the sides of the canyon with narrow ledges like the one to Angel’s landing. Only the Virgin River Narrows were physically possible for the Traveling Morgans, and the Narrows was flooded both times we were there. Had we been able to take that hike, our attitude night be different. 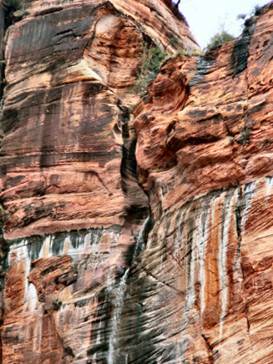 If you are a technical rock climber or do not mind narrow ledge hiking climbing high up from the valley floor, you might find Zion to be wonderful. It is beautiful, but we did not find it as beautiful as the other four national parks in Utah. Access is to the main valley is only by shuttle most of the year and our dogs were not allowed on the shuttle. 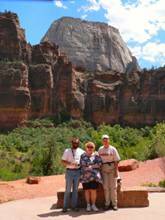 The Kolob Canyon section, however, was beautiful and lightly visited in spite of an entrance just off I-15. We would like to visit this section again. Looking up at great places. Good, but generally rated higher than it should be. 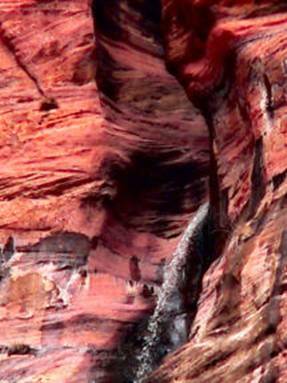 There is an intriguing waterfall in Zion near the entrance to the Virgin River Narrows at the shuttle turn around. A little known but outstanding portion of a well known national park close to I-15. This picture was stitched together from several pictures.